My latest essay for Network Awesome Magazine where I discuss the role of women in relation to historical witchcraft and domesticity in the 1960 Christopher Lee-starring “classic” Horror Hotel. 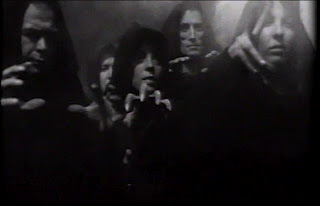 Appropriately, the title is derived from the Iron Maiden song in which the video featured clips from the film. Witchcraft is alive and thriving in the small town of Whitewood in which the atmospheric 1960 film Horror Hotel or City of the Dead (John Llewellyn Moxey) is set. From prosecuting women as witches to exploiting traditional gender roles prescribed to women in the early 1960s (sister, girlfriend, caretaker), Horror Hotel begins in the 17th century with the rather gruesome burning of condemned head-witch Elizabeth Selwyn. This opening scenic depiction of a witch and her relationship with the devil is strikingly similar to Mario Bava’s Mask of Satan/Black Sunday (1960), however this story is deeply rooted within the Puritanical history of the United States and, in particular, the terrifying witch trials that targeted young women in Salem, Massachusetts in 1692. Like Black Sunday but unlike the Salem witch trails, the witches in Horror Hotel are all too real and their devotion to Satan means trouble that spans the centuries. Obsessed with researching the history of witchcraft in New England for her term paper, college student Nan Barlow (Venetia Stephenson) ventures off to Whitewood per the suggestion of her stoic professor Alan Driscoll (played by the scene-stealing Christopher Lee). Stubborn and strong willed, Nan dismiss the concerns of both her boyfriend and brother on the quest to discover something about Satanic worship that has never been known before. Combined with her somewhat condescending approach to the small town, this pretentious ambition to be a scholarly researcher is the core of her naiveté. Nan’s lack of common sense and the inability to gauge her surroundings ultimately leads her to a bloody sacrificial demise on the infamous Candlemas Eve. Nan’s journey within Horror Hotel parallels, in some ways, that of Marion Crane (Janet Lee) in Alfred Hitchcock’s seminal thriller, Psycho, that was also released in the 1960. Both narratives exploit gender roles and feature a determined blonde who thinks she knows better than everyone else, striking out on her own, and who ultimately winds up paying for this bull-headedness with her life. Similarly, the audience main identification is with Nan for half of the film – her journey is our journey – as it is with Marion Crane. When each character is brutally killed (both young women are stabbed), the directors make it clear that anyone is fair game for the slaughter. Useful information. Fortunate me I discovered your web site by accident, and I’m shocked why this coincidence did not took place earlier! I bookmarked it.